Three days of lessons to ride and audit with Eddo Hoekstra! Eddo is fully committed to dressage as an art and a sport. His mission is to provide high-quality dressage clinics, lessons and training, from Basic to Grand Prix level. Eddo's students thrive on his knowledge, wisdom, compassion, and ability to address the needs of horse and rider alike. His own dressage center is in Peterborough, Canada; Eddo travels all over Canada and the United States. He's returning to Nita Jo's Place in central Minnesota for the first time since 2012. We are excited and want to share this wonderful instructor with all. Come ride or audit; whether you are an experienced, advanced dressage rider and/or competitor or completley new to the sport, Eddo will enliven your understanding and skill. Nita Jo's place has a lovely CoverAll indoor arena (185x85)with a training size dressage arena inside. There is a raised platform for the comfort of auditors. The arena is light, airy, beautiful, and perfectly suited for this event! Rider spots will go fast! Cost of the clinic is $440 For registration forms, click here. Are you ready for the next level? Would you like to be ready? Or are you already playing in the next level but feel "stuck" because of the technological hoops to jump through in order to submit a video audition?? Would you like to have that official audition under your belt? Whether you want to aim toward official Level 2 or Level 3 auditions-- or "just" spend 3 days learning and advancing with your horse and your Online and Freestyle Riding skills, this clinic is for you! Come join us for three days of learning, results, fun, and emotional fitness growth! We'll videotape at least one Savvy for everyone who'd like to do this. You can submit it for official assessment or use it for your own learning. Either way, you'll come away with increased confidence about what to continue to practice on your own as you progress. This clinic is limited to 6 participants in order to give everyone plenty of individual attention and time to play and ride with your video camera running. Bring a spouse, partner, or friend (at no charge) to help you! Limited to 6 students. Barn apartment, trailer living quarter, and RV plug-in available for human accommodations. Horses have 12' x 12' outdoor pens or 10'x14' indoor stalls. Get started, get safe, get savvy! This clinic is for Parelli students of Level 1 and Level 2 in order to introduce you to Parelli Natural Horsemanship, 7 Games on the ground, and how to ride Freestyle. If you've never been to a Parelli clinic before and are just getting started, then this is for you! It's also perfect for current students of Levels 1 and Level 2. You would be amazed what you and your horse can learn and achieve when you revisit the beginning! You will find it especially useful and encouraging if you've been feeling stuck or are encountering puzzles and problems you haven't been able to solve. Everyone experiences challenges to their progress; don't let it get you down. Come join us! Come learn from Nita Jo, one of Parelli's top instructors! Improve your horsemanship under her experienced and savvy eye. Twin View Stables at Dorian is lovely, has a large, scenic outdoor arena with plenty of comfortable space for auditors. There is indoor arena in case of inclement weather. The owners are a joy to work with and will make you feel very welcome. facility fee. Stall fees, bedding, hay are extra. $425 for the weekend, which includes facility fee. for stall reservations, fees, directions, and facility questions. Get your "good" better and your "better" best! 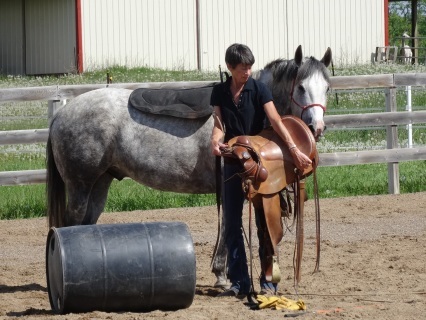 Learn from Nita Jo, one of Parelli's most experienced instructors, improve your horsemanship under her expert, savvy eye. Make progress, solve problems, meet challenges, improve your understanding and have fun! Refine your communication with your horse, improve your play and riding, develop your horse's connection and responsiveness. Learn to be even more polite and light while gaining increased rapport, respect, impulsion, and flexion! Online play will focus on using your body to express your intention and energy so it's not about the stick! Learn ways to apply the 7 Games which prepare your horse and you for greater connection when riding. Riding will focus on developing greater responsiveness for both Freestyle and Finesse. Learn more about how to develop a seat connection with your horse and refine your aids, increase hind quarter control and advance lateral maneuvers. This will prepare you both for riding with concentrated reins in Finesse and for bridleless riding! 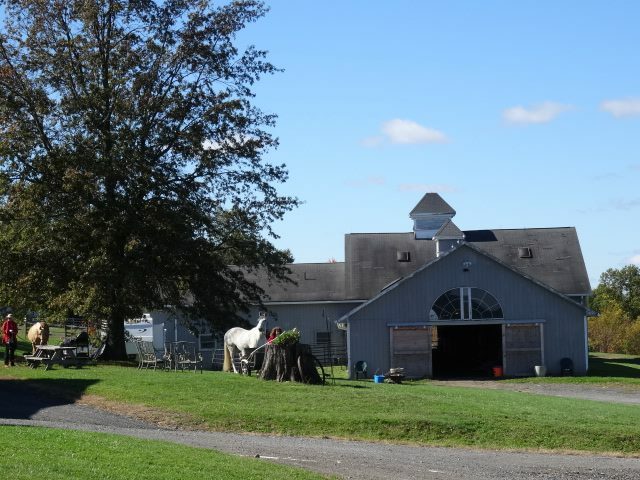 Twin View Stables is lovely, has large, scenic outdoor arena with plenty of comfortable space for auditors. There is an indoor arena in case of inclement weather. The owners are a joy to work with and will make you feel very welcome.